Avery Dennison Label Guns and Labels are just one of the many brands of labelers. Finding the right label gun can be daunting so we have broken it down to 1-line price guns, 2-line price guns, and accessories for easier digestion.American Retail Supply offers a repair and cleaning service on most Avery Dennison Label Guns. Please contact us at 800-426-5708 for more information. 1 Line Avery Dennison’s are hand held labeling tools that only print 1 line. This is useful for quickly price tagging items or SKU/item number. We have two types of 1 line label gun, 5 or 6 characters. This limits the number of characters the labeling gun can write to a label. If 5 or 6 characters is not enough space, then check out our 2-line labeler which has more character limit and information per label. 2-line Avery Dennison’s place double the information as its counterpart, 1-line label gun. 2-line labeling guns can write 2 lines instead of 1. Without needing to choose either price or item number, now you can write both. This increases productivity and quickly move to more important tasks. Also, these labeling guns have a higher character limit of either 8 or 10 characters. 8 character labeling guns let you choose how you display cents/value after the decimal, which 10 character labeling guns do not have. Either show your cents underlined without a decimal or with decimal. As default all our labeling gun prints underlined. Accessories are essential and complete Avery Dennison price labelers. The two accessories needed are labels and inkers. Specific labels and inkers only fit specific Avery Dennison labelers. Beware to check the model you purchased before ordering your label and inker. All our labels come in multiple colors. We have blank fluorescent red, orange, green, blue and much more. We also have labels printed with “SALE" or “SALE PRICE." 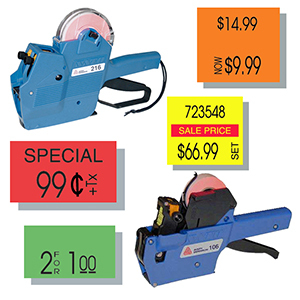 If you have a 1 line label gun or 2 line label gun with 8 characters or 10 characters, you can find all your labeling needs at American Retail Supply. Lastly, we have 2 types of inkers and just like our labels, it all depends on the type of labeling gun you have. 1 type of inker for 2-line labelers, whereas, 1-line labeler requires a different type of inker.